Billy Mckay bagged a hat-trick for Ross County. Billy Mckay bagged a hat-trick as Ross County dismantled a hapless Dundee United 5-1. Mckay’s treble came courtesy of three assists by the superb Josh Mullin, with further goals from Sean Kelly and Mullin himself completing the rout. 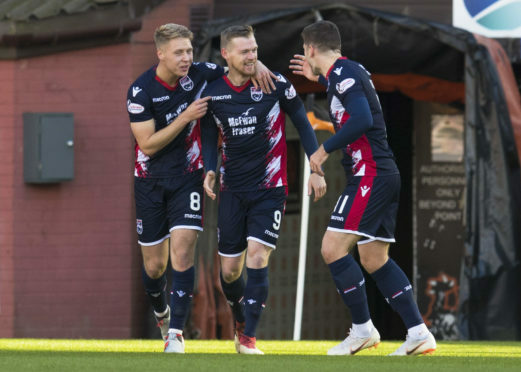 Pavol Safranko had levelled the scores after Mckay’s first goal but in truth United were woeful, with Stewart Murdoch’s second-half dismissal compounding their misery. County made two changes from the goalless draw with Caley Thistle, as Iain Vigurs and Mullin replaced Brian Graham and Don Cowie. Both of these sides were part of a tight top four at the start of play, with United and County level on points but trailing Ayr United and Caley Thistle. United were nearly gifted a perfect start by County skipper Liam Fontaine, who attempted a back-pass that was well underhit and allowed Yanick Loemba a free run at goal. He delayed his shot and Scott Fox stood up well to block. Mckay, one of four County players who have turned out for United, opened the scoring 11 minutes in from point-blank range, reacting quickly when Matej Rakovan parried Mullin’s cross at him. The visitors should have made more of Jamie Robson’s mistake, when his missed header allowed Mullin to race clear but he put too much on the cross for substitute Davis Keillor-Dunn. United equalised on 17 minutes as a frantic opening continued. Fraser Aird’s deep cross from the right was allowed to travel all the way to the back post where Safranko was waiting, with his first-time finish beating Fox. Mullin was having a field day down the right and County’s second goal again came with a helping hand from him, delivering a carbon-copy cross that Rakovan parried straight to Mckay. Unmarked, Mckay was allowed to pick his spot and struck well from 12 yards. Rakovan’s day got worse four minutes before the break as he allowed Kelly’s right-wing free-kick to travel all the way across goal and watched as it sneaked in at the far post, giving County a two-goal cushion. Stuart Kettlewell and Steven Ferguson’s side continued to rub United’s noses in it, with two further goals that had the Tannadice faithful turning on manager Csaba Laszlo in their droves. First a flowing counter-attack on 50 minutes, involving Vigurs and Mckay, teed up Mullin for a tap-in at the back post, before Mullin rolled a simple pass across the six-yard box for Mckay to complete his hat-trick from three yards. The ignominy was not complete for the hosts as Stewart Murdoch, who had only been on three minutes as a substitute, was given a straight red card for a stamp on Jamie Lindsay, after bringing the midfielder down. The game was now reduced to a possession exercise for County, who move up to second with an afternoon to remember.